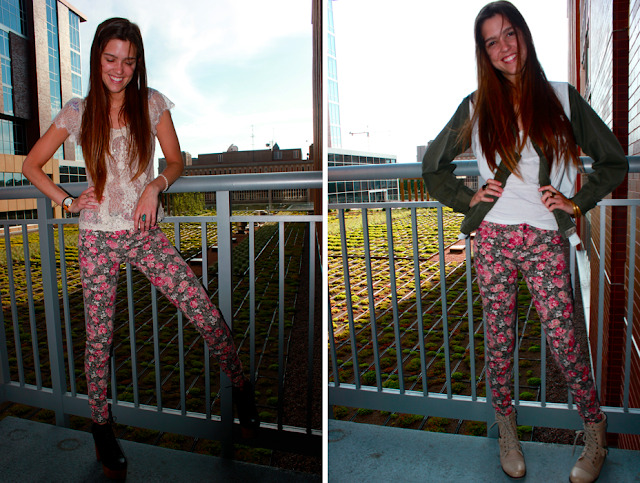 Look Sharp, Sconnie - Midwestern Fashion Nerd, Chronic Over-thinker: Floral pantalones: Two ways. I wore sweatpants my entire Sophomore year of high school. I'm serious. It's completely unreal to think back to that time and imagine what was going through the 87% of my mind that's now devoted to harem pants and high-waisted denim. Hyperbole aside, I do wonder how I went about each day so unconcerned with the cladding of my lower half, especially on days like today when it's such an in-your-face component of my personal image. These floral pantalones were quite the impulse buy - mainly because I was not only lost, but running 20 minutes late and stuck in a 10 billion hour dressing room line at Brandy Melville in Soho. I saw a girl way ahead of me try them on, proceeded to awkwardly fawn over how good they looked on her, and ultimately rushed to the checkout line to get a pair for myself. I don't care. I'm Gabby. I gab. So sue me. Anyhow, I decided to try and wear them two different ways. oh look at me. I'm so silly. Army jacket, jean vest, military boots. I'd say I've sufficiently countered any threat to my inherent masculinity that the pink floral print may have posed. Then I just gave up and succumbed to their womanly wiles with see-through lace and heels (which the 5-o-clock hard shadows conveniently hid). Are those pearls on my wrist? Yes. Yes they are. If you're gunna go, go all the way baby. All or nothing. Always. (or never). I think it's more likely I'd wear the cargo ensemble on a daily basis - but the lace will do for nights out with the Gos. He likes it when I show a little skin. I'm digging the floral with the lace. I'd say this was a pretty sweet impulse buy. yay floral pants. I'm loving it. love love love our flower print skinnies, can't wait to wear mine tooOO! Love the trousers, I'm always a fan of anything floral :). Probably prefer the second look but both really are gorgeous! I absolutely love those floral pants!! Thanks for stopping by on my blog and leaving that great comment. WOW, I like the lace top with the flower pants! !